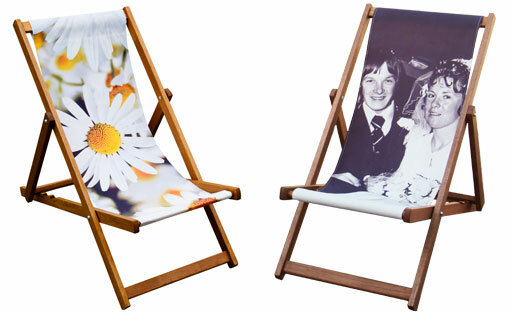 Designer printed deckchairs, choose between standard size deckchair, Wideboy size. 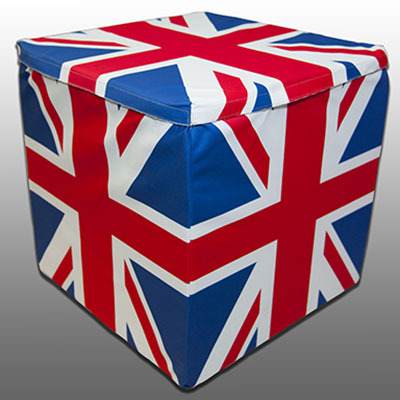 We have a wide range of colourful and funky designs available. We can also supply replacement deckchair slings for your old deckchair. They makes an excellent personalised printed photo gift as a quirky unusual Birthday Present or Wedding Present and unique Christmas gifts. 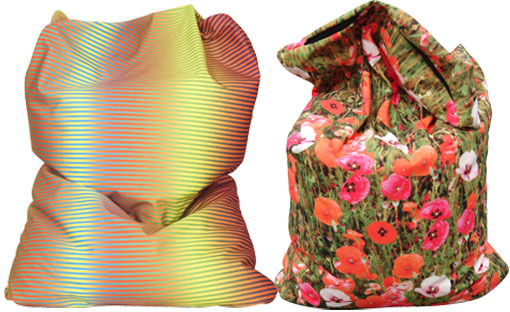 Designer beanbags. Finished complete with Polystyrene bead fillings. 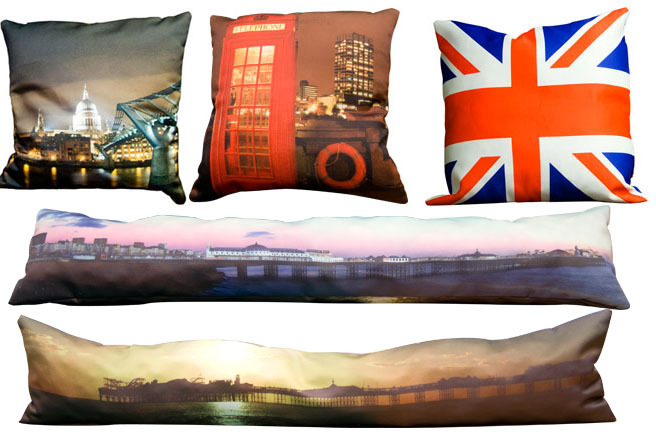 We have a wide range of colourful and funky designs available. We offer a worldwide fast and reliable delivery service. 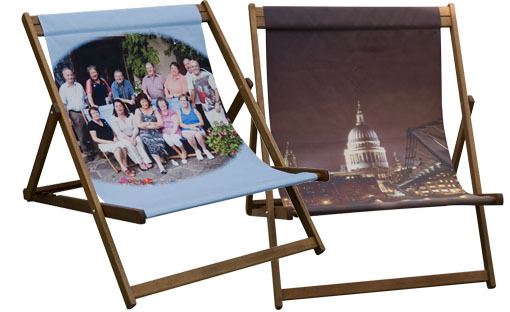 Have your own designer deckchair created with your own favourite photo, artwork or design printed onto the deckchair canvas sling. We can also supply replacement deckchair slings for your old deckchair. Personalised deckchairs are excellent personalised printed photo gift as a quirky & unusual Birthday Present or Wedding Present and great Christmas gift ideas for all family friends. 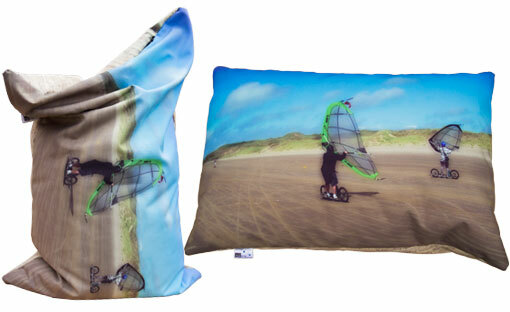 Have your own designer Wideboy deckchair (double deckchair) created with your own favourite photo, artwork or design printed onto the deckchair canvas sling. Wideboy deck chairs are also known as two seat or double deckchairs. We can also supply replacement deckchair slings for your old deckchair. Personalised Wideboy deckchairs are excellent personalised printed photo gift as a quirky & unusual Birthday Present or Wedding Present and great Christmas gift ideas for all family friends. Turn your photographs into high quality canvas print artworks. Finish printed on high quality, light fast Giclee canvas and fine art paper. Canvas prints are excellent personalised printed photo gift as a quirky & unusual Birthday Present or Wedding Present and great Christmas gift ideas for all family friends. High quality printable Flip Flop, with a durable 14mm soles manufactured from a natural rubber compound. Create your own personalised flip flops with your own photo's or designs. Makes an ideal wedding gift to take on honeymoon why not get one pair for Mr and one pair for Mrs? Available in 3 adult sizes children's sizes are also available here. Beautiful memories transformed into canvas artworks, your baby's first photo! Finish printed on high quality, light fast Giclee canvas and fine art paper. Babyscan artworks are makes an excellent personalised printed photo gift as a quirky unusual Birthday Present or Wedding Present and great Christmas gift ideas for all family friends. Have your very own Popart artwork created from any photograph or digital file. Finish printed on high quality, light fast Giclee canvas and fine art paper. Pop art prints are excellent personalised printed photo gift as a quirky unusual Birthday Present or Wedding Present and great Christmas gift ideas for all family friends. These selection of canvas print outdoor artworks are excellent for enhancing all gardens, and out door areas. Part of Eyes Wide's Art Decko collection. 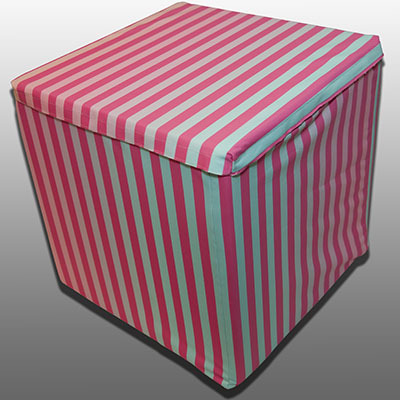 Printed photo cube seats 45cm³. EyesWideArt.com offer personalised photo gifts, high quality designer deckchairs and beanbags, printed personalised photo cushions and draught excluder, iphone covers, canvas prints, printed Windbreaker and outdoor artworks, all printed and produced on-demand, and not available in high street shops. All of our products can be purchased with your own photographs, artworks and designs printed on them or they can be produced with our professional photographs and artworks. You can order on-line and upload images through this site. 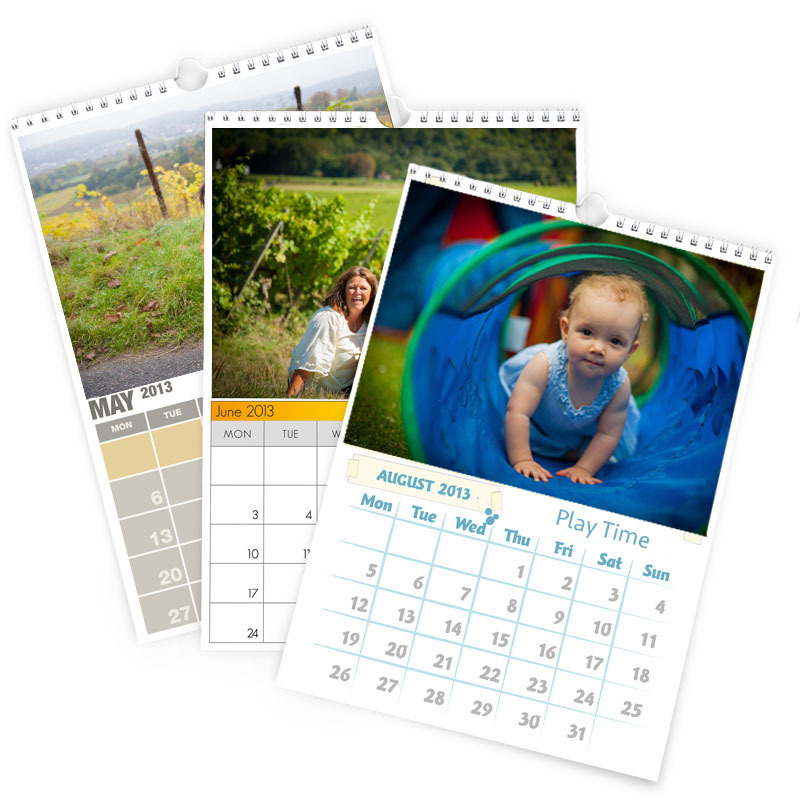 We can print photos taken with iPhones (including the iPhone panoramic feature), camera phones, digital cameras and your photo's uploaded to Facebook, Google +, Twitter, Tumblr, Pinterest or flickr. 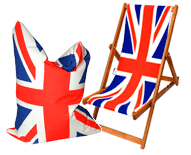 Eyes Wide have launched a range of designer deckchairs, wideboy deckchairs and beanbags with designs of the national flags. These deckchairs are a great way to transform your gardens into relaxing den. They also add a splash of colour to your garden. We can make up your own Flag design with your own message on it. FIFA World cup flagg deckchairs. As featured on ITV's This Morning with Laurence Llewelyn-Bowen. Featuring our stunning Deckchairs, Windbreakers, and Beanbags on This Morning. Our clients are located all over Redhill, Reigate, Croydon, Guildford, Brighton, Kingston upon Thames, Richmond, Gatwick, Heathrow, Leatherhead, Epsom, Surrey, London, England, South England, Kent, Sussex, South coast, UK, United Kingdom, Europe.